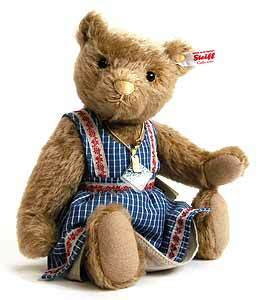 Pauline Teddy Bear by Steiff. This beautiful hand made piece, in dark blond mohair, is fully jointed and wears the white ear tag, signifying this item as a Steiff limited edition, together with the famous gold plated Button in Ear. Limited edition of only 1500 pieces worldwide. Product details: safety eyes, synthetic filling material, non growler, size 27cm. Comes boxed, together with a numbered certificate of authenticity. They were known as being industrious and skilful, the seamstresses who produced the Steiff animals under the guidance of Margarete Steiff in 1903. Their workplace with the large glass windows was locally referred to as the "spinsters´ aquarium". An elaborately made pinafore dress, proudly worn by Pauline Teddy bear, harks back to the old days on the 135th anniversary of "Steiff": her clothing is an exact replica based on historical photographs, sewn from woven cotton material and braided in the style of "Redwork"- embroidery. Hanging from her necklace is a splinter from the original glass window pane of the 1903 factory building. Pauline Teddy bear, 27 cm tall and made of the finest dark blond mohair, is the perfect insider´s tip for this year´s autumn/winter collection. Production is limited to 1,500 pieces.